The listing of the successor to Tecno Phantom 6 has been spotted on GFXBench website. According to the listing found on GFXBench about the device, the phone name is Phantom 7 and it will boot Android Nougat 7.0 out of the box. The listing reveals some of the specifications of the phone. It will pack whopping 4GB of RAM and 32GB of internal memory (expandable up to 128GB via MicroSD). The listing further reveals that the phone will be powered by Mediatek Helio P25 SoC clocked at 2.3GHz and sports a 6-inch display with FHD 1920 x 1080 pixel resolution. The camera department of the phone are not that impressive, it packs a 13MP rear camera alongside a 5MP front camera while Canom CX packs 16MP. Well, the GFXBench didn’t reveal that phone will come with Fingerprint sensor or not but the final specifications of the device will decide if it will pack Fingerprint sensor or not. 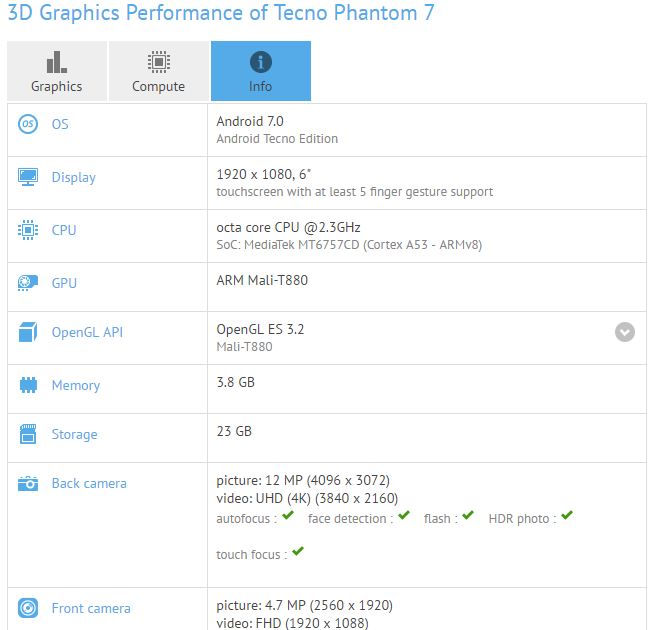 So guys, What do you think about the next Phantom series of the Tecno Mobile judging by this specs spotted on GFXBench? READ MORE Google Newest Android Version Officially Named "Nougat"